Since January 28 of this year, one tragic death per week has occurred at JPMorgan among men in their 30s, the latest occurring yesterday — a statistically improbable random occurrence. 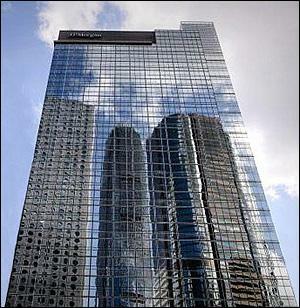 Each JPMorgan employee worked at a headquarters’ building in a key financial market for JPMorgan – London, New York, and Hong Kong. And in each and every case, the press has been blocked from obtaining vital information to properly do its job. The deaths started on January 28 when Gabriel Magee, a 39-year old technology Vice President, was found dead on the 9th level rooftop of JPMorgan’s European headquarters at 25 Bank Street in the Canary Wharf section of London. After much prodding by Wall Street On Parade, the Metropolitan Police in London could not confirm that one eyewitness to the fall existed despite London newspapers widely circulating the story that commuters and colleagues observed Magee leap from the building. After more prodding, the Metropolitan Police now state that no further details will be released until a Coroner’s Inquest is held on May 15. That’s more than 100 days from the date of death when mainstream media will have likely lost interest. According to friends and family, Magee was a vibrant, happy individual with a great sense of humor. He had emailed his girlfriend the evening before his body was discovered that he would be home shortly. When he did not arrive, his girlfriend reported his disappearance to police. Magee’s body was spotted on the 9th level rooftop by co-workers looking out windows on higher floors of the building who then called police at around 8:02 a.m. the next morning. Six days after the death of Magee, Ryan Crane, an Executive Director who was involved in trading at JPMorgan’s New York office, was found dead in his home in Stamford, Connecticut on February 3. A total and complete press blackout has been instituted in that death. The Chief Medical Examiner’s office will only say that the cause of death is “pending” and final results will not be announced for several more weeks. Wall Street On Parade called the Stamford Police yesterday to ask for the police incident report. Under Connecticut sunshine laws that report should be available to the press. We were informed that if we were able to obtain the incident report, most information would likely be redacted. Why is the press not able to report to the public the time of day that Crane’s body was discovered and the location of the body when the police arrived. Those details are clearly known to the police and the Chief Medical Examiner. Why are they being withheld from the press? Press reporting on the third unexplained death at JPMorgan in three weeks has now entered the twilight zone of “news” reporting thanks to obfuscation by JPMorgan. Major media have characterized the worker as an “investment banker,” a “foreign exchange trader,” and a low level employee who worked in “operations.” These are job functions that are highly remote from one another; they are decidedly not interchangeable job titles. Yesterday, JPMorgan explained away its information lockout as follows: “Out of respect for those involved, we cannot comment further.” We can understand that a responsible human relations department would want to notify the family before releasing the individual’s name to the press but it is now more than 24 hours later and the press is still in the dark. At 5:13 a.m. this morning, February 19, reporter Charles Riley assisted by Vivian Kam of CNN released an update to the scant information reported yesterday. The report shows that JPMorgan is still refusing to release the man’s name. CNN reports that: “A source at the bank said the man — identified by police only by his surname, Li — was a junior employee.” We now have a fourth characterization of what this individual did at JPMorgan and we are no closer to any credible information than yesterday. There are tens of thousands of people with the surname Li. The one major newspaper that has failed to report on the string of deaths is the New York Times. The last we heard on this matter from the New York Times was on January 28 when Chad Bray and Jenny Anderson reported on the death of Gabriel Magee. Given that criminal charges were leveled against JPMorgan by the U.S. Justice Department for facilitating the Bernard Madoff fraud just 21 days before the onset of these weekly, unexplained deaths – one would expect to hear that the FBI is involved in this matter. (Wall Street On Parade emailed the media relations department for the FBI and did not receive a response.) While JPMorgan was permitted to settle the Madoff charges with a deferred prosecution agreement and a payment of $1.7 billion, the bank now has a rap sheet and the deferred prosecution document contains an overt threat to indict the company if more criminal conduct is detected. The Madoff charges were part of a yearlong series of costly settlements for every manner of alleged fraud at JPMorgan: from mortgage fraud, to credit card malfeasance, to rigging electric markets, to gambling with insured deposits in the London Whale debacle — bringing the tally of its get-out-of-jail free cards to $30 billion in a period of 13 months. The company remains under investigation in the Libor and foreign exchange rigging matters.